It was a grey and cold day here yesterday and I felt the need for something nice for afternoon tea and to welcome the D’s home from school and work. 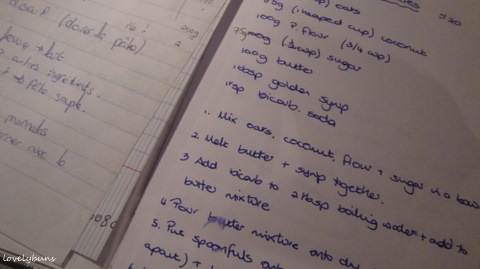 My recipe book fell open at this page which was perfect as these biscuits are very speedy to make – is there any other sort ? These are made in a flash and are good and crunchy, nice and rugged looking! Melt the butter and syrup in a pan then add the bircarb soda solution. In a large bowl mix flour, oats and coconut together, make a well and pour the butter/syrup mixture over the dry ingredients and stir everything together. Leave to cool and gel together for a few mins, then take small spoonfuls of the mixture and using your palms, roll into balls. 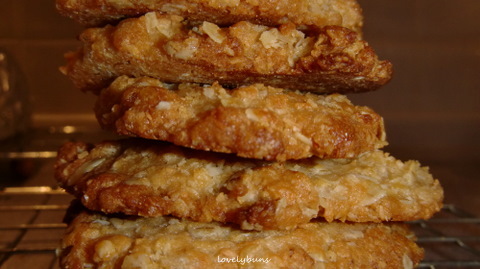 Place on baking trays leaving a couple of cm between each biscuit and flatten slightly with the back of a fork. 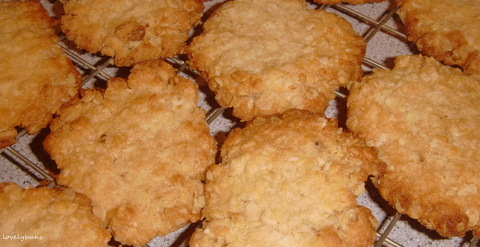 (If the fork sticks to the mixture, dip it into boiling water for a second before touching the biscuit mixture) . Bake at 180°c for 8-10 mins then remove to a cooling tray. 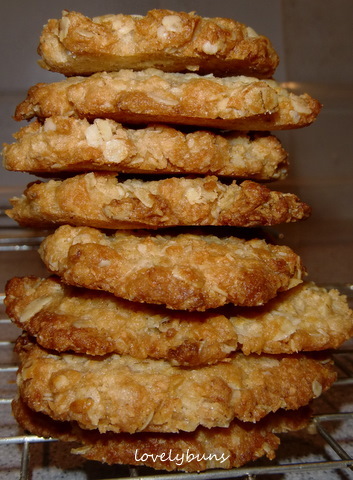 When eaten warm they are a bit chewy, if left to cool they are more crunchy- if chewy biscuits are preferred, increase the amount of golden syrup in the recipe and they won’t harden so much. These are also nice if you add a dozen chopped cherries at the same time as mixing everything together. Your stuff here is wonderful. The pictures here on the left are making me hungry. I would like to invite you to view my blog savorthefood.wordpress.com . After checking it out, sign up it’s FREE! OK can’t take looking at your sweet treats anymore. Going out to kitchen to get something to eat. Thanks for your time and your wonderful posting. Thanks and sign up if you like, it’s FREE.